Fiberglass front doors are rising in popularity in homes across the country. Fiberglass is a versatile, beautiful material. This makes it suitable for almost any style of home and for interior and exterior use. Some consumers avoid upgrading because they do not know enough about it. Other people may have misconceptions about its cost or maintenance. Fiberglass is quite different from other materials often used to make doors. For example, there is a huge difference in fiberglass doors versus wood ones. Learning more about this material can help convince you to use it for your front door. There are many advantages to incorporating fiberglass in your choice of door. In fact, once you learn more you may never go back to traditional doors again. Customers interested in fiberglass entry door prices can visit Southern Front. They have their products listed online at http://www.southernfront.com, including prices. Prospective customers can also contact them by calling 281-890-5860. They are happy to answer your questions about upgrading to a fiberglass door. Take a look at a few facts about fiberglass below, and then visit Southern Front to find your perfect door today. When most people think about front doors, they imagine an old-fashioned wood door. There is nothing wrong with wood. In fact, it is still a common choice among homeowners. Installing fiberglass doors versus wood doors does offer a few benefits and advantages. For starters, there are many styles of fiberglass available. It comes in many different finishes, looks and stains. You can even find some fiberglass doors designed to resemble real wood. One of the biggest benefits to fiberglass is its ability to insulate. It can keep a home much more temperate than wood can. Some homeowners even see a reduction in energy costs after upgrading to fiberglass. Its durability means that your door will last much longer before you need to replace it. These types of doors will stand up to the elements much better, and will not warp or fade over time. Customers considering fiberglass doors should contact Southern Front. Southern Front Stained Glass and Doors has a wide selection available. They have fiberglass and composite doors available in many different styles. You can see their products online by visiting http://www.southernfront.com. If you do not find a model you like, ask about custom options. Interested customers can contact them by calling 281-890-5860. Fiberglass is very easy to maintain. It is one of the easiest materials to keep in like-new condition. There are some general cleaning guidelines that homeowners should keep in mind. These guidelines are important for those who have fiberglass entry doors with sidelights. The addition of the sidelight adds an extra step to these care instructions. Avoid using harsh chemicals on solid fiberglass. These chemicals will often cause the finish to fade or flake off. Instead, use gentle cleansers. Many homeowners make their own, using vinegar or mild dish soap and warm water. Wipe down your door with this cleaning solution using a soft cloth. Always dry your door afterwards to prevent streaking. If you have glass inserts, avoid getting the glass cleaner on the fiberglass. Spray it onto a clean cloth instead of onto the glass. 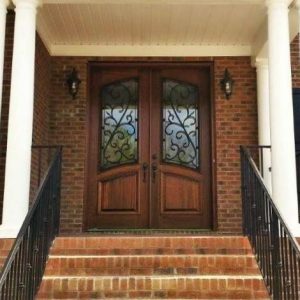 If you like the look of fiberglass entry doors with sidelights, visit Southern Front. They have many styles available, including those with decorative sidelights. Interested customers can see their products online by visiting http://www.southernfront.com. You can also call Southern Front at 281-890-5860. They are happy to help you find the perfect door. Southern Front will also ensure you know how to keep it looking beautiful for as long as possible. Fiberglass entry door prices do tend to be a bit higher than traditional wood. This is because of the many advantages that come with buying fiberglass. The material is much more durable than wood, meaning your door will last longer. Fiberglass can also insulate better and looks more attractive. These doors can also add a lot to your home’s market value. Homeowners will see a big return on investment when opting for fiberglass doors. As you shop around for the perfect door, avoid focusing on cost alone. There is a risk that you will wind up with an inferior door from a disreputable company. Vendors you can trust will offer high quality doors at affordable prices. It is important to avoid cheap doors because they will not last as long. Cheap fiberglass will not insulate as well, either. Spending a bit more now will save you a lot of money down the road. Southern Front has a wide selection of fiberglass doors available at affordable prices. Take a look at their selection online by visiting http://www.southernfront.com. You can also contact them by calling 281-890-5860. If you cannot find a style you like in their catalogue, ask about custom options. Southern Front has a fantastic reputation for providing customers with high quality door. Take advantage of the benefits fiberglass brings by shopping at Southern Front today. Before you decide to buy, be sure that you have chosen a style you love. Your front door is an important investment. Not only does it set the tone for your whole home, it will also impact your curb appeal. Fiberglass doors are available in an almost endless number of styles. You can also find composite doors, combining elements of fiberglass and other materials. Since there are so many styles from which to choose, you should take your time with this decision. If you do not find a door you love, investigate custom fiberglass models. Customers who want to learn more about fiberglass doors can contact Southern Front. Southern Front has many doors available, including fiberglass entry doors with sidelights. You can view their entire catalogue online by visiting http://www.southernfront.com. Customers can also contact them by calling 281-890-5860. They also offer custom solutions, so you can be sure you buy the door of your dreams. Consumers in the U.S. and Canada looking for fiberglass front doors should visit Southern Front today.